College life is much different than high school life. If you are used to living with your family, now it is time to get ready to live alone or with roommates when you are in college. Although some of you may still live with family, once you are in college, your life will be much different than when you are in high school. #1. You probabably won’t know a person sitting next to you. In high school, it is common to know everyone in your class and easy to make friends. However, it will completely different in college. It is often difficult to know few people unless if you have a group assignment. So if you are looking for new friends, try to get involved in some of the college activities or perhaps introduce yourself to a person sitting next to you in class or a roommate. It is a great start. But don’t get discouraged if you don’t make a new friend on the first try. In high school, you are forced to learn all the subjects in the curriculum while in college you only need to learn the subjects that you take in your courses. Although it sounds like you have less responsibility, college is more difficult than high school with those extra readings and assignments. Having a great time management skill in college is essential in order to succeed. #3. At some point, you will attend just one class in any given day. So be prepared! In high school, you must wake up early for school while in college you only wake up for your first class. Sometimes you need to go home before the next class begins. If you live far or don’t have enough time to go home, you should try to use your free time between classes to study. In high school, you live with your family while in college you get to live with a roommate on campus. It is important to get along with a roommate and build a good relationship with your roommate. In high school, you only have few assignment while in college you are most likely to spend much of your time with college assignments and doing the research. Learn to prioritize your college assignments first before anything else. High school books are cheap or free, but college textbooks are the most costly. If it is possible, try to buy a second-hand book or rent a book for your semester. In high school, you have plenty of free time while in college it is nearly impossible to have enough break. Learn to manage your time and create a balance between college life and personal life. In high school, it is mandatory to attend the classes while in college it is strongly recommended to attend the classes. However, attending classes in college is vital to your success. You will miss a lot of important information if you skip your classes. In high school, you can do the homework a night before you hand it in while in college you need at least few days to research thoroughly before doing the assignments. So don’t do your assignment at the last minute. In high school, your family is usually in charge of you financially while in college you must manage everything by yourself, starting from paying for the textbooks to paying for your lunches. Learning to manage your finances before getting into college will be very helpful. College life is not an easy life to live. You need to know more what to expect when you get into college. 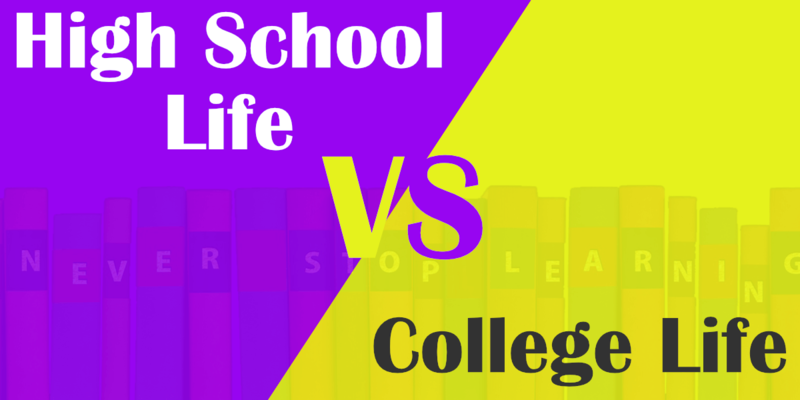 Knowing the differences between life in high school and college will help you handle the transition.